Franz Margitza is a Detroit native and director of research for a Cleveland TV station. Here he talks about his debut short story—”Eulalia,” from our current March/April 2019 issue—and about the appeal, attributes, and modern context of Gothic romance literature. We were in a coffee shop when I mentioned that the issue would be released soon. She looked at me and warmly smiled, before raising her brow—baiting me to continue. “Um, yeah—like The Cure,” she said. I understood where she was coming from. To many, the word “gothic” can infer something very different. And soon, I began a very poor attempt at defining the tradition. Dark, decaying, brooding, ghosts, demons, passion, curses, and romance—these were some of the words I wanted to use, but nothing came out correctly. It was a jumbled mess. And as I sat there, trying to explain the intense romanticism of Heathcliff in Wuthering Heights, or the sullen lament of the protagonist in “The Raven,” I found that I was not making much headway. “These don’t sound like healthy relationships,” she said. 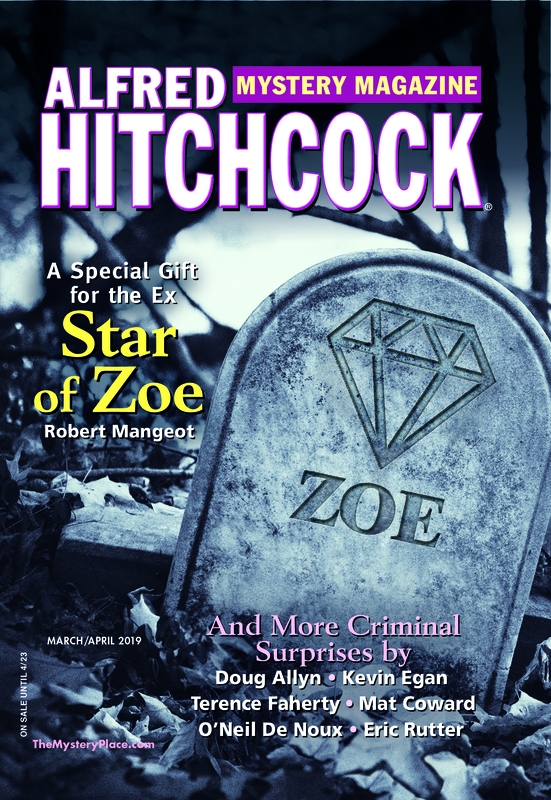 It was the mystique that comes with the Gothic tradition that had inspired me to write my story featured in the March/April Issue of Alfred Hitchcock Mystery Magazine, titled “Eulalia.” The inspiration began with the image of a chamber room, a bedroom in an antiquated abbey. In that room I imagined, was a large stained glass window, and directly below—the crypt of a lost love, entombed to be near the very bed she once shared with the narrator. What kind of obsession would drive someone to bury their deceased love in the very room in which they slept? Is it a quality of love that would force someone to do so? Or maybe some sort of mental derangement? Then again, is there much of a difference? That can be debated. But I’ve always found the dark brooding Byronic hero to be a champion of romance. There is a special quality in the diction used in Gothic literature that spoke to me. A musical quality, with an elaborate description of even the smallest details. The rhythm of the words, the lilting quality that remain with the reader, it’s all a part of the grand scheme. And to be quite honest, it almost felt as if I needed to overwrite—to over describe. To use words that, I must admit, I had to double-check in the dictionary just to be sure I had the correct definition in mind. And I thought back to my days in journalism school, when they took a red pen to every phrase, every word, and every letter that wasn’t essential to telling the most simplistic, concise story possible. “Kill your babies,” my old professor would say. He was a tall, thin veteran newspaperman. And what he meant by kill your babies—or kill your darlings, as some refer to it—was to take out all the little things you love about your story, that don’t add to the overall message you’re trying to convey. Thereby, anything that is too descriptive, or flowery, must be omitted. As well as anything that sounds too cute, too creative, or too ornate. So, a sentence like “A fierce, turbulent squall brewed far off on the horizon, encroaching upon the barren landscape, like a violent tempest” essentially becomes: “It rained”—more or less, anyway. Thus, my training was in vast opposition to the tradition of Gothic writing. And it was daunting to attempt to write in such a way. A way that I was taught not to write. However, the rhythm or the pulsing cadence is something I’ve always truly admired. And I tried my best to mimic that sound. But as I sat there sipping my coffee—I saw her point, and a question arose. Today, does Gothic romance still have its place? Can the Byronic hero still be viewed as heroic? Or is he simply an all-out villain? She followed up her question. “What makes you think those characters you mentioned are in any way romantic?” she asked. There was silence. We both took a sip of our coffee. The sound of the rain was beating against the window of the coffee shop, and we both knew that soon we’d have to brave the nighttime storm that started on our way back to the car. A storm that might be describe as a fierce, turbulent squall . . . (and so on, and so on). Then, she spoke.